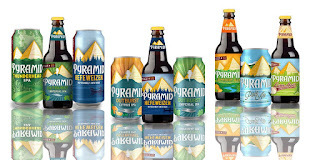 Seattle,WA- Pyramid Brewing Co. today debuted an invigorated brand aesthetic and experience encompassing an expanded line of canned brews, the addition of Outburst Citrus IPA to Pyramid’s year-round line-up, all-new packaging and revamped digital channels across its website and social media. As part of the rebrand, Pyramid will release canned beers for Thunderhead IPA, Hefeweizen, Outburst Citrus IPAand Outburst Imperial IPA. These canned brews are ideal for PNW outdoor activites as they pack easier and chill faster. The novel Outburst Citrus IPA brewed with orange and tangerine peel debuts in 12 oz. cans and 22 oz. bottles. It’s big hop flavor is matched flawlessly by the tasty, aromatic, citrusy punch of the orange and tangerine peel.